You are invited to meet five of the ten artists selected for Neighbourhood Spaces (NS), Windsor & Region’s new socially-engaged artist residency program. Supported by the Ontario Trillium Foundation (OTF), NS is a partnership between Broken City Lab (BCL), Arts Council Windsor & Region (ACWR) and the City of Windsor. 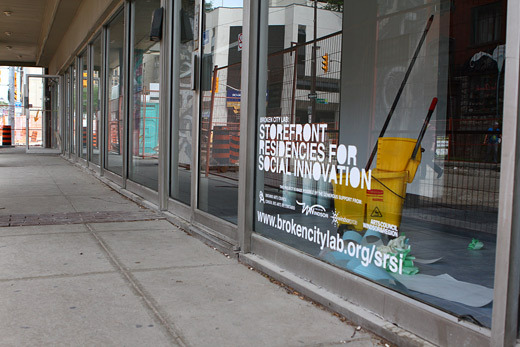 Stop in Broken City Lab’s CIVIC SPACE, enjoy a bite to eat and learn about the artists, their residency projects and the NS Program. Food and light refreshments will be provided and Arturo Herrera will be making his famous handmade tortillas. To learn more about Neighbourhood Spaces (NS), the artists and their projects, visit: www.acwr.net/ns or www.brokencitylab.org/ns Follow the program on the NS Blog & like us on Facebook, follow us on Twitter. A partnership between “The Collaborative” : Arts Council – Windsor & Region, Broken City Lab and The City of Windsor. This program is made possible through the generous financial support from the Ontario Trillium Foundation. Visual artist, musician and director, Lisa Lipton a.k.a. FRANKIE, kicks off the 2013-2014 artist-in-residence line up for Neighbourhood Spaces (NS), Windsor & Region’s Artist-in-Residence Program. During her residency, Lisa will be developing a ‘Windsor-based Scene’ at Atkinson Skate Park for her docufictional film, BLAST BEATS. Each scene is being constructed as FRANKIE travels across North America, inspired by the people, places and situations she encounters. Community members often become participants, collaborating and influencing various ideas, musical and visual elements within the work. 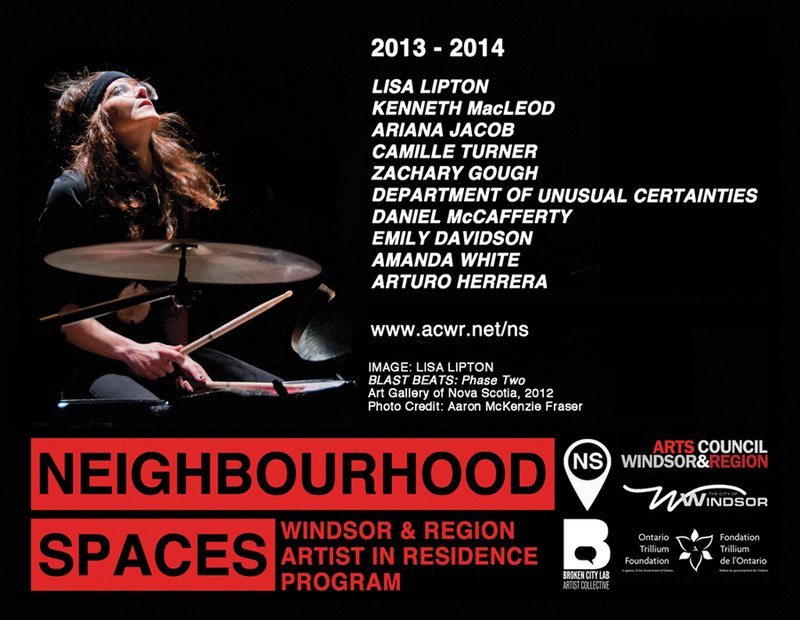 Neighbourhood Spaces (NS) is an initiative of Arts Council Windsor & Region (ACWR), Broken City Lab (BCL) and The City of Windsor that will locate ten chosen Canadian artists in community sites throughout Windsor and Essex County in Ontario, for 4-6-week artist residences. Supported by the Ontario Trillium Foundation, this new program will allow artists to work in non-traditional spaces in non-traditional ways, by embedding artists in community sites to discover, explore and respond to the stories, triumphs and challenges of the community. 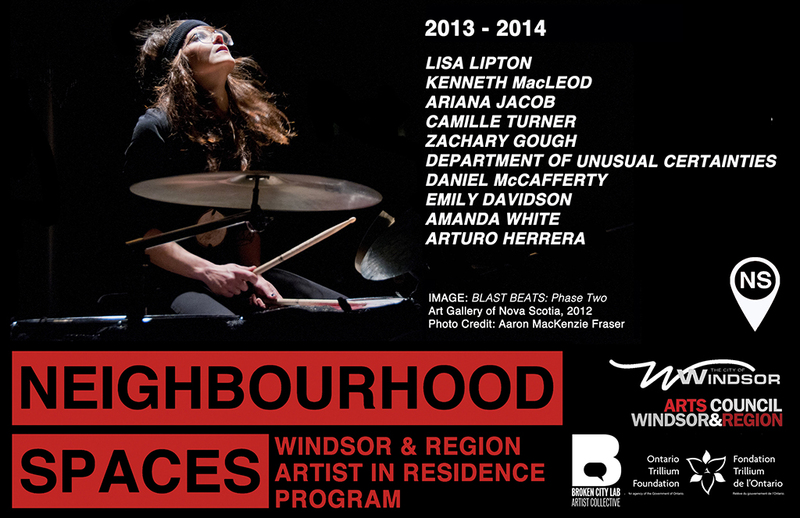 Neighbourhood Spaces Artists-in-Residence Announced, Lisa Lipton Starts this Week! The 2013 – 2014 Neighbourhood Spaces (NS) artists-in-residence have been announced! Residencies kick-off this week with Lisa Lipton (Halifax, NS) at Atkinson and Forest Glade Skate Parks in Windsor, ON with her project: BLAST BEATS: Phase Three. BLAST BEATS: Phase Three is an exploration in alternative methodologies for building a feature film on the road that spans the scope of Lisa’s experiences as a visual artist, musician and director. Each scene is being constructed in different locations across North America and explores the potential within transforming multi- media installations and performance into film sets and scenes. The narrative evolves with each place and space, and is informed its local community members and conversations with participating collaborators. Through mixing landscapes, people, artistic practices and genres of music, the project aims to unite a vast linage of creative energy in order to create a diverse story and feature film that transcends time and space. For her 6-week NS residency, Lisa will facilitate the making of a“Windsor-based SCENE” at the Skate Parks of Windsor to be included in the larger docufictional film. Late last week, two Portland artists–Nicole Lavelle & Sarah Baugh–arrived at CIVIC SPACE in a brown Volkswagen Westfalia camper van to spend a couple weeks exploring Windsor and eventually designing a Windsor Tour Guide publication. They took a few minutes yesterday evening to ask each other questions about what their collaborative project at CIVIC SPACE will entail. Stay tuned for more announcements about their publication launch, happening April 18th at CIVIC SPACE. Work.Place is an awesome project by Portland photographer Carlie Armstrong which aims to document the spaces in which creativity is housed. I suggest browsing through a few of the photo sets; they are gorgeous. If this doesn’t make you want your own complete workspace, I don’t know what will! We are very pleased to announce the following artists in residence for our upcoming Homework: Infrastructures & Collaboration in Social Practices project. We’ll be announcing our keynotes and conference participants soon, followed by further details on the entire project in the coming weeks. In the meantime, you should consider registering to attend the conference (ps. it’s free). new models for art education and research. 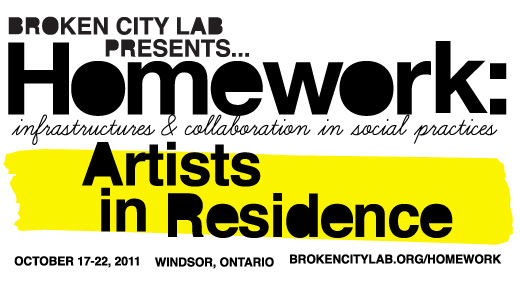 Facilitated by Broken City Lab, HOMEWORK calls on artists, scholars, writers, thinkers, and doers interested in any of the above to join us in Windsor, Ontario on October 21 and October 22, 2011. Homework: Infrastructures & Collaboration in Social Practices is generously supported by the Ontario Arts Council, the University of Windsor’s School of Visual Arts, and our community partner the Art Gallery of Windsor. 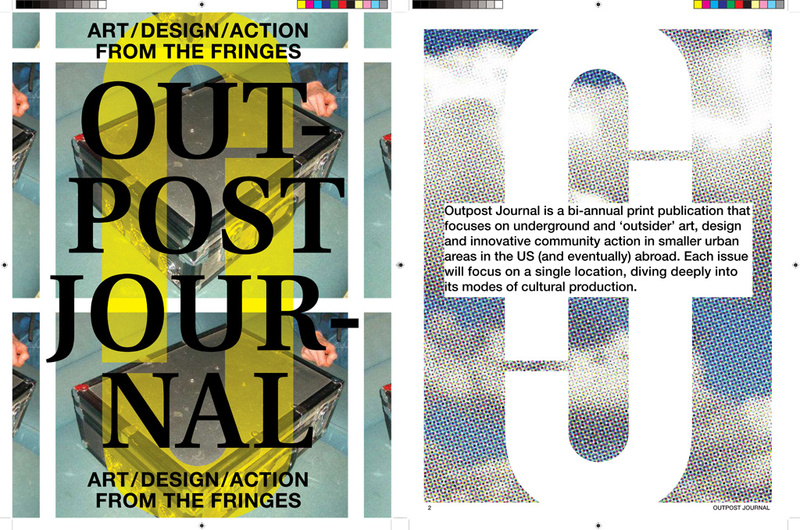 Outpost Journal is a biannual, non-profit print publication on innovative art, design and community action from cities that have been traditionally underexposed beyond their local contexts. Founded in 2010, Outpost aims to give wider exposure to artists and activists from smaller cities back in more recognized centers of artistic practice and commerce, such as New York and Los Angeles. Outpost is a journey into the creative heart of a place. Via features like Secretly Famous (profiles of the most infamous artsy locals), guerrilla engagements with tourist attractions, historical explorations, mapping projects, and deep dives into artist collectives and organizations, Outpost plans to expose the myriad ways in which unique local communities arise through creative collaboration and production. Support it over at their Kickstarter Campaign. On Saturday, Eric, Danielle, and her sister, Jessica, and I headed over to the Power House neighbourhood walk in Detroit. I’d been hoping to finally see this project in person, as it’s been a little over two years since I first wrote about it here. I’d missed their residency at the DIA (saw the installation, but didn’t get to see Mitch or Gina) and also missed them at MOCAD (but seeing their Neighborhood Machine on exhibition was very cool). So, to be able to get a tour and talk to Mitch about their project was really, really great. Above, a to-do list from artist-in-residence, Monica Canilao, who plan to return to purchase the upper-half of this duplex. Official Day 1 of SRSI kicked off, lots of new folks starting their projects, vinyl is up, rooms are painted (and almost done), floors are clean, the storefronts are open!!! Come see us.